Being part of a community can really help to buffer the stress, struggles and chaos of modern life. Particularly if that community has at its essence the purpose of making their lives healthier, finding greater balance and becoming more conscious. When people come together and connect through a common thread, so much more can happen than when doing it alone. There’s an energy that’s created that’s bigger than the parts. It creates a synergy. All of us go through times in our lives which are stressful, confusing or difficult to navigate and even with technology connecting us so much more, unless we have people around us to help us through, it’s very easy to feel isolated. We need people who we share a bond and real connection with to get the support that we need. These are the people who will help you find a solution where you might not have been able to find one on your own, or shed a different perspective on something you can’t see. They can offer guidance and resources or maybe just listen when you need to express something. Common unity. We are stronger together. When we practice yoga as a collective we share and entwine into each other’s energy. Whether we are conscious of this or not we create community through this connection. 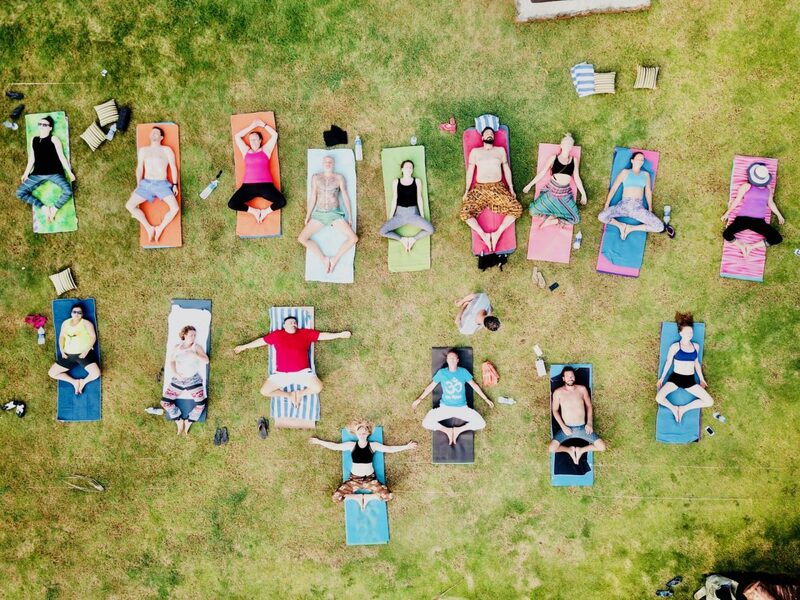 When we come together to practice yoga, you may not even aware of it but the communal energy is carrying everybody in its rhythm, the flow of the breath and the the synchronised movement…it lifts everyone. It can inspire you to push your practice a little bit further and explore a bit deeper into your own experience. Then afterwards you care share it… exchanging a few words after class, getting tips, sharing a breakthrough or a struggle is lovely. You can even get that community feel without speaking –from simply seeing familiar people who you’ve had practising near you week after week. The bonding and relationships that are formed through doing this thing together that you enjoy and want to grow in are so important to our well-being. Humans are social creatures – in fact we need each other for survival – and these interactions are key to our mental, emotional and physical health too. Recently someone told me about the Blue Zones – pockets of the globe where people live longer and healthier lives than anywhere else on the planet. The people there live not only longer, but better and typically do not suffer the degenerative diseases common in most of the industrialised world. The things these groups all have in common are they move constantly throughout the day, eat wisely (mostly plants), and have purpose in their lives. The biggest one is their relationships – they have close relationships with their families, close friends and strong social networks..their community. The researchers found this seemed to have the greatest impact on their longevity and well-being. Love and connection are key to all of us living well and gives our lives meaning. There are so many things you can’t do alone but with others they become possible. We are better together…. This studio is our community.